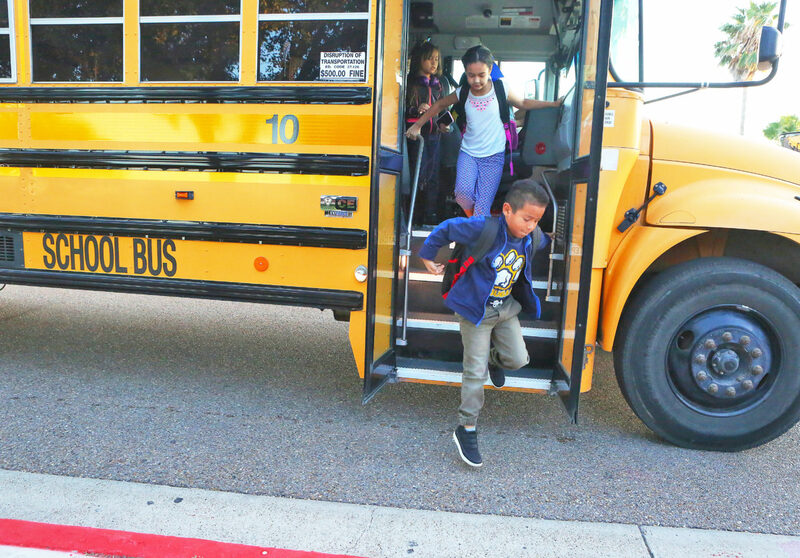 Students leave the bus on their way to class on the first day of school Sam Houston Elementary School on Monday, Aug. 27, 2018, in McAllen. Rio Grande Valley school districts will be receiving $90,664,238 of Title I formula funding, U.S. Rep. Vicente Gonzalez, D-McAllen, confirmed Monday. Funding will go toward providing students with equal and significant opportunities to receive a high-quality education, according to a news release from the congressman’s office. Final totals will be released by the U.S Department of Education in June. In a prepared statement, Gonzalez said that investing in Title I is imperative for local school districts to continue providing students comfortable environments to strive for higher education. According to the release, the final allocations will differ from preliminary disbursements due to updates of the annually collected counts of children in locally operated institutions that support neglected or delinquent children, or those in foster homes. The number of families above the Census poverty line who receive assistance under the Temporary Assistance for Needy Families program will also affect the final allocations, the release stated. The released numbers will also be different from the local education agencies’ finance data used in the Education Finance Incentive Grants formula, and if a state were to report revisions to its State Per-Pupil Expenditure data. In his statement, Gonzalez also said he will continue to be a voice for the students of the 15th District of Texas and will do what it takes to bring additional funding to schools across South and Central Texas.